The Maritime Air Squadron (MAS) in collaboration with the Mauritius Post released on 17 July 2015 a Special Commemorative Cover to mark their 25th anniversary. The MAS is the air wing of the National Coast Guard (NCG - the maritime wing of the Mauritius Police Force). In keeping up with the strategic objectives set by the NCG Headquarters, the Dornier and the Defender aircrafts have accomplished all assigned missions with flying colours in the past twenty five years. 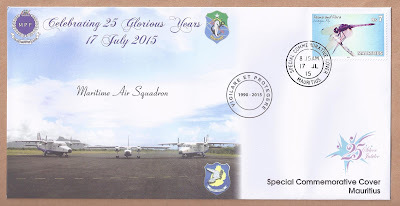 The Silver Jubilee also marks twenty-five years of accident-free flying for the squadron. The crest of the MAS represents the endemic Mauritius kestrel (Falco punctatus) with a map of Mauritius in the background and their motto in the bottom portion. 4. Support for outer islands of Mauritius, namely: Agaléga, Rodrigues and Saint Brandon, including casualty evacuation. Surveillance & law enforcement: to enforce maritime laws of Mauritius by airborne surveillabce of coastal waters and the EEZ. Anti-piracy: act as deterrence for pirates in the Mauritian EEZ. Search & rescue: to protect life and property at sea. Humanitarian assistance: to provide humanitarian assistance to citizens living in the outer islands of Mauritius by carrying out casualty evacuations and logistics support. Pollution response: to respond to maritime pollution within the EEZ. Operational environment: to maintain high order of flight safety at the squadron. - The MAS was commissioned on 17 July 1990 by Sir Veerasamy Ringadoo, the then Governor General of Mauritius. - The first aircraft of the MAS, a Dornier-228, was acquired in 1990 from Hindustan Aeronautics Ltd., India. - The squadron acquired a second aircraft, Defender (BN-2T), from Britten Norman, UK in 1992. - In 2004, the squadron acquired a second Dornier-228 aircraft from Hindustan Aeronautics Ltd., India. The MAS currently operates only those three fixed-wing aircrafts. - In 2008, the MAS received the ISO 9001:2008 accreditation from the Mauritius Standards Bureau. N.B. : The above text is adapted from the insert. This Special Commemorative Cover was a private issue.